The thermodynamics of the earth's crust I. Preliminary survey of the principal forces and reactions in the solid crust. During field studies and theoretical considerations of metamorphism and metasomatism I have arrived at the opinion that the apparently so multifarious and intricate processes of metasomatism are led by very simple principles. By recognizing these principles, we may get a clear and simple survey of the total metabolism of the Earth's crust. 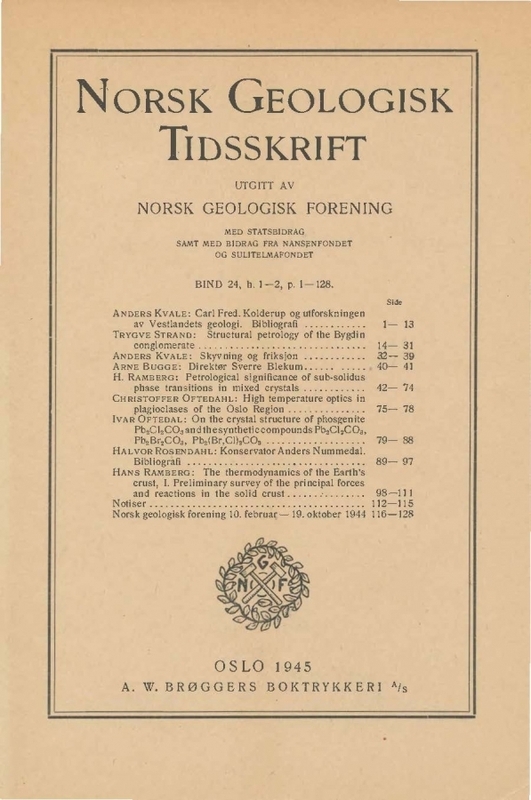 After the works of V. M. Goldschmidt, P. Eskola and others it has been a matter of course that the paragenetic transitions during metamorphism of a rock are led by chemical forces. But such transitions do not demand any considerable transport of matter. In most cases the minerals are in direct contact with each other. But as soon as the distances over which the substances must have been transported have reached a considerable amount, a mechanical transport of exceptionally mobile compounds has been suggested. For instance: injection of magmas along planes of schistosity, flow of aqueous solutions through smaller or greater fissures in the rocks, transport of gaseous compounds such as: FeCI8, SnF4 etc., and transport of the pore liquid in the so-called intergranular film. But the forces which drive this wandering of compounds have never been fully understood.